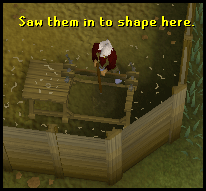 Northeast of Varrock, at the Lumber Yard, is every Woodcutter's dream training method. The Sawmill has opened its training area to the public! Once you reach level 80 Woodcutting, you too can join the fun of making new types of planks for wonderful Woodcutting experience. You will work for Jill the Overseer and must create planks to send off in return for some fairly decent Woodcutting experience. There are quite a few methods to get to the Sawmill, the most common of which are shown in the map below. Earth Altar Tablets are obtained from The Great Orb Project Activity for 36 tokens each. Just teleport to the Earth Altar, leave via the portal and run north a short distance. This is the fastest route. Other Requirements: Must have unlocked the Varrock Route. This is the second fastest method and requires you to be near another Hot Air Balloon to begin with. Once you arrive, head northbound. This enchanted Ruby Necklace allows you to teleport to just north of the Digsite. From there, head north, through the gate and to the Sawmill. Take the Gnome Glider ( ) to the location near the Digsite and go through the northern gate, then head north to the Sawmill. 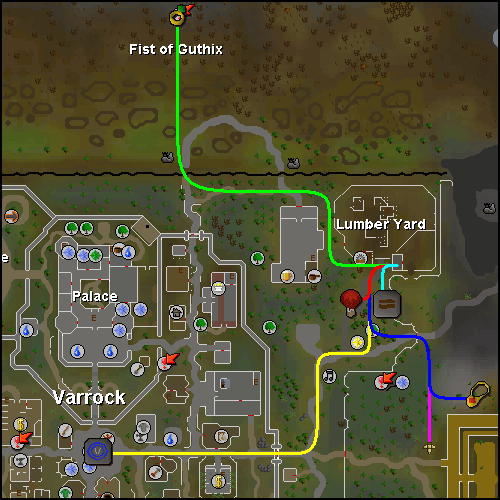 Use the Ring of Duelling to teleport to the Fist of Guthix Activity from which you should head south, over the Wilderness Trench, then south-east past the pub and to the Sawmill. Warning: There may be revenants in the Wilderness, so this route is most dangerous. Teleport to Varrock Centre and head east. Once you are past the city borders, head north, inclining slightly north-east at the statue. This is the longest route, but safer than the Ring of Duelling method. 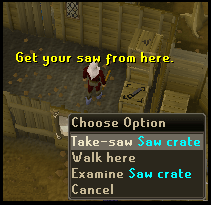 Once you arrive at the Sawmill, you must enter the smaller room to the right. In the first room, or hallway, there is a crate with a Saw, which you will need. Now go through the next door. Talk to Jill, the Overseer and she will explain about the Sawmill Training Area. She will also stress that you do not receive planks from the tasks. As you can see, there are two types of task - Quick Tasks and Long Tasks. Quick Tasks are designed to take a shorter period of time to complete, compared to that of the Longer Tasks. The Longer Tasks, for that obvious reason, yield more experience. Once you have chosen your task type, you are ready to continue. You can keep track of the number of each plank you have made by looking in the top-left corner of the screen. Once you have chosen your task, you must now gather some logs. Thankfully, the Sawmill has provided you with a huge pile of logs, from which to take some. Just north of the tasks lists are many logs. 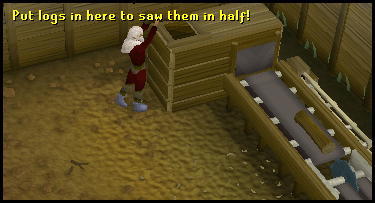 Right-click on any pile and choose 'Take Logs (many)'. This will fill your inventory with logs, unless you stop it. Once you have gathered 27 logs (the 28th space being filled with the saw), you are ready for stage two - sawing the logs in half in to planks. So, head north-east to the conveyor belt and the revolving saw. Click the box-like part of the contraption, located at the northern end. Fill it with the logs from your inventory. This will send all your logs along the conveyor belt and saw them in half. After this, they will end up in the crate at the other end. Once all your logs are planks, you can go down to the other end and collect 27 planks. Remember that you have doubled the number of planks, because you get two planks from each set of logs. Assuming you put 27 logs in, you now have 54 planks in the crate. Note: The crate can only hold 126 Planks, which means only 63 Logs can be cut. Once your inventory is full of planks, you are ready for the third and penultimate stage. Head to one of the two work benches and click it. Once you have done that, choose the type of log you wish to make. If you cannot remember what you need to make, look at the progress tracker in the top-left corner of the screen. 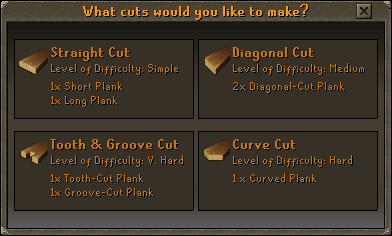 Once you pick the type of plank to make, right-click and choose 'Make-X'. Type in the number of planks you wish to make, but beware diagonal planks can yield two per normal plank. You will then begin sawing. You gain experience for each successful plank made, details of which can be found in the 'rewards' section. If you do receive this message, you will have to try to make the plank again. Thankfully, as your Woodcutting level grows, this will occur less often. Once you have successfully made a plank, it will automatically be placed in the Dispatch Cart. When all of the given objectives have been completed, you will have finished your task. Remember to withdraw any extra planks you happen to have in the cart to save time on your next task. This is done simply by clicking on the Dispatch Cart. Once you are at the menu shown above, withdraw any extra planks you have. Once all numbers are at their required value, close the menu. You can now finish the task by talking to Jill, or right-clicking her and choosing 'Finish job'. There is only one reward for this Activity, which is Woodcutting Experience. Straight Cut giving 1 Short plank and 1 Long plank gives 15xp. Diagonal Cut giving 2 Diagonal-cut planks gives 18xp. 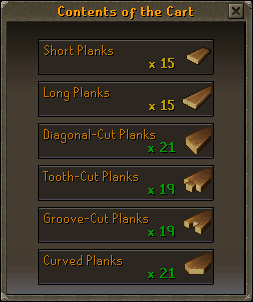 Tooth & groove cut giving 1 Tooth-cut plank and 1 Groove-cut plank gives 25xp. Curve Cut giving 1 Curve-cut plank gives 22xp. Also, you receive bonus experience for each job completed. You will receive 4,500xp for a completed Quick job and 9,500xp for a finished Large job. There are quite a few simple tips and tricks for this training method. Firstly, use all planks in the crate before you cut any more. If you use the workbench nearer to the collection crate, it will save you time when collected some more planks. Secondly, if you have one, use a Crystal Saw. 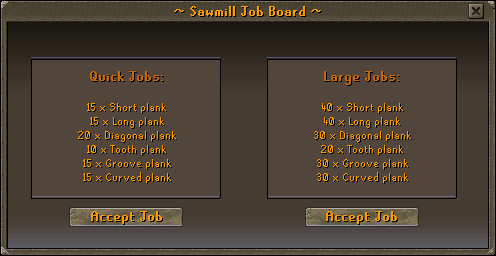 This will double all experience earned from cutting planks, meaning if you need 20 Diagonal-cut planks, instead of getting 180xp, you will receive 360xp! Next, if you have any Lumberjack clothing, it will give you some bonus experience from cutting planks, but you will not get any extra experience for completed a job. Fourthly, withdraw extra planks. This is vital as it will save you time on the next job. Also, to save some extra time, right-click the Overseer instead of going through the conversation to complete the task. Finally, if you have some run energy, use it. It may not seem helpful when used, but in time it all mounts up.